This young couple bought their first house together and transformed it into their forever home. 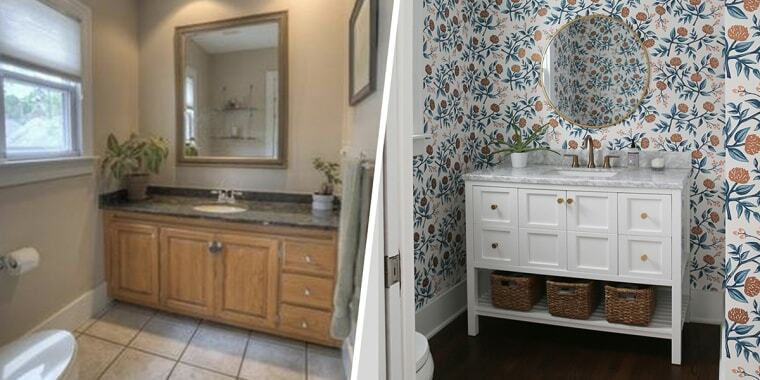 Between the whimsical wallpaper, gorgeous vanity and perfect mirror, it's hard to decide which element to love most in this guest bathroom. For home owners Jenna Cook, creator of the blog For Richard or Poorer, and Brandon Curry, a realtor at Sotheby's, that wasn't always the case. The couple fell in love with each other almost instantly, but the house took a little longer. "Brandon and I met less than two years ago," Jenna Cook told TODAY Home. "From our first date we knew it was meant to be." Since then, the couple has taken on a major project: renovating their 1926 fixer upper in Ferndale, Michigan. "There isn’t one thing in the house that we haven’t touched or re-done," said Cook. "Our goal was simple: to make our first house our forever home." They started working on their guest bathroom knowing that they wanted to incorporate their favorite wallpaper — a print from the Hygge & West line by Rifle Paper Co. — but it was pricey. Luckily, Curry found the exact pattern being sold for a fraction of the price on eBay. Once they found the wallpaper, they tried to save more cash by installing it themselves, but quickly realized that this wasn't the right place to cut corners. "We soon realized we had no clue what we were doing — we tried our best but the pattern was too intricate," Cook said. "So we called every wallpaper person in the phone book and came across an incredible woman who swooped in to finish the job." But Curry and Cook put in their share of elbow grease: They pulled up six layers of old flooring that had been layered on top of the original pine themselves. In total, they removed more than 2 inches worth of old flooring, which left them with an unexpected problem: the need to lower the molding. "The molding wasn’t salvageable unfortunately," said Cook. "So we had custom molding made to mimic everything else in the house." Oh, and that great vanity? Cook found it on Home Depot's website. From there, the couple installed a new window, LED lights and completed the look of the vanity with cute baskets for storage at Lowe's. The total cost of the renovation came out to around $3,000. "Truly, we created our dream home," said Cook. "We can’t wait to enjoy it with each other for the rest of our lives."